By removing the crosscut knife spindle and / or the circular knife spindle(s), the Urschel H can also cut strip cuts (two-dimensional cuts) such as for french fries, and slices (single dimensional cut). An optional "G" kit is available to extend the range of this machine to overlap with the Urschel model G, and we can otherwise complete this machine with cutting parts to buyer specification: Please call 315-589-4511 to discuss your particular food process cutting machine need. Stainless steel product contact surfaces, including slice shell and impeller with 7 inch slice shell opening, cutting spindles and knives. 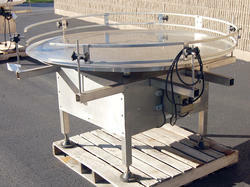 All food grade stainless steel construction including spindle arms, guards, shrouds and tubular stainless steel frame. 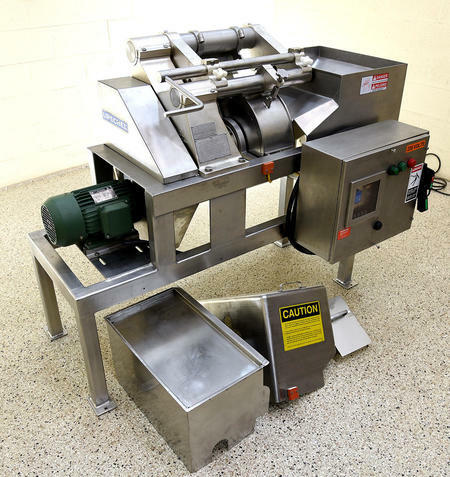 As of this writing, this reconditioned Urschel dicer is in stock, in the process of being reconditioned to EXCELLENT operational, mechanical, electrical and cosmetic condition, needing only to be fitted with cutting parts to buyer specification prior to a timely shipment. URSCHEL COMITROL PROCESSOR, Model 1500, 30HP. Manufacurer recommended industrial tons-per-hour food processing applications, for milling, fine grinding, high-shear emulsifying, homogenizing, and finishing; of viscous and liquid food products, such as fruit nectars, fruit butters, condiments, sauces, dressings, pulps, gelatins, soy milk, baby formula, tomato ketchup, barbecue sauces, vegetable purees, beverage concentrates, and creams and ointments. 2 inch threaded pipe infeed. Microcut cutting head with Unicut impeller (a range of parts are available for this machine, CALL 315-589-4511 to tell us YOUR cutting specification!). 3 inch Tri-Clamp discharge outlet. 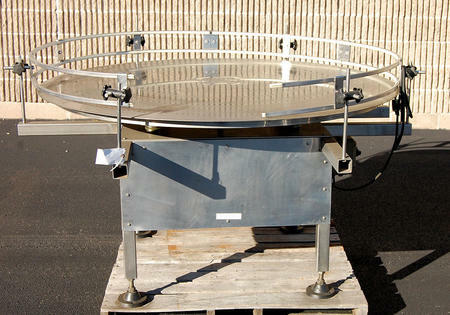 45 inch infeed height, 38 inch discharge height, on Urschel standard stainless steel support frame. Interlock safety system, with operator control panel, and brakemotor drive. 30 horsepower 208/230/460 volt 3 phase brakemotor drive. As of this writing, this Urschel Comitrol 1500 grinder is in stock at Alard, in good condition, available for timely service and shipment. 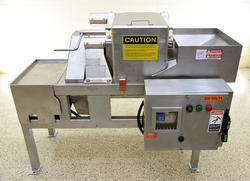 CALL 315-589-4511 to confirm availability, and to discuss your particular food process particle size reduction needs. 6.5 foot discharge height as configured. 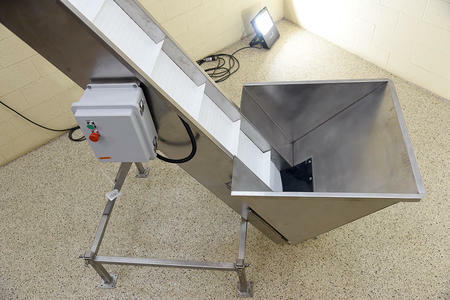 32 inches long by 30 inches wide by 20 inches deep in-feed hopper with a rubber flapper to prevent product from escaping out the bottom. Food grade interlocking plastic chain type cleated belt with 2 inch high cleats on 12 inch centers. 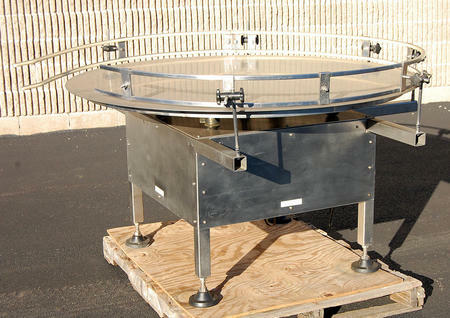 The belt runs between 3 inch high stainless steel sides. Stainless steel drive shafts with plastic sprockets. 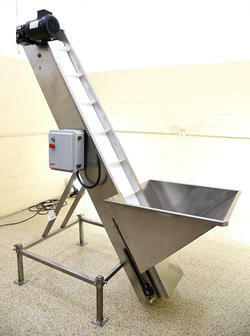 38 inch infeed height into hopper, 83 inch discharge height. 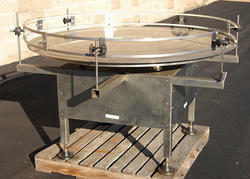 42 inch square tubular stainless steel stand for stability. All food grade staniless steel construction. 1/2 HP drive, with 208/230 volt 3 phase variable speed controller. As of this writing this inclined belt conveyor is NEW in stock at Alard, ready to go and available for immediate shipment.